Black Raiders avenge last season's playoff loss. 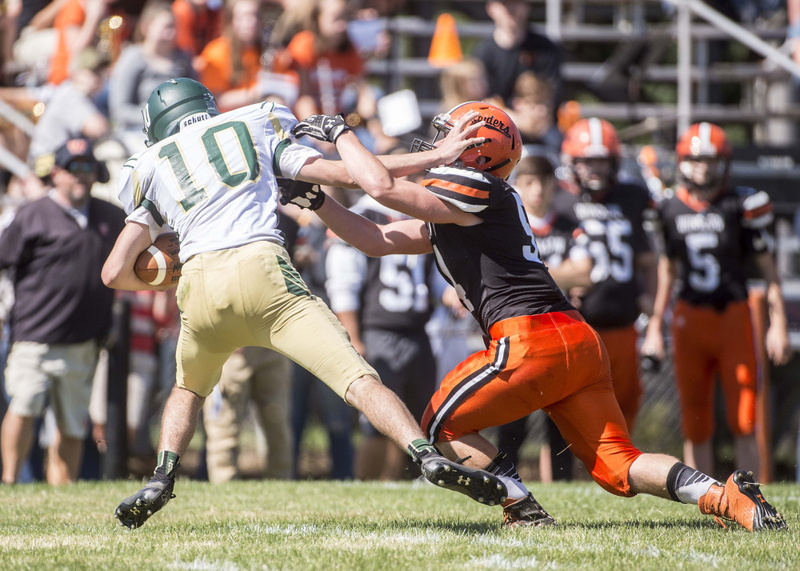 WINSLOW — On Saturday afternoon at Poulin Field, they played November football in September weather. The last time Mt. Desert Island and Winslow played, it was for the conference championship. In the season opener Saturday, the teams seemed to pick up right where they left off on that cold night in Bar Harbor last year. Then, MDI earned the close victory. This time, it was Winslow eking out the win. The Black Raiders made a defensive stand late in the fourth quarter to preserve a 21-20 win. After forcing a Winslow punt from midfield, the Trojans took over at their own 25-yard line with 3:04 to play and down one point. 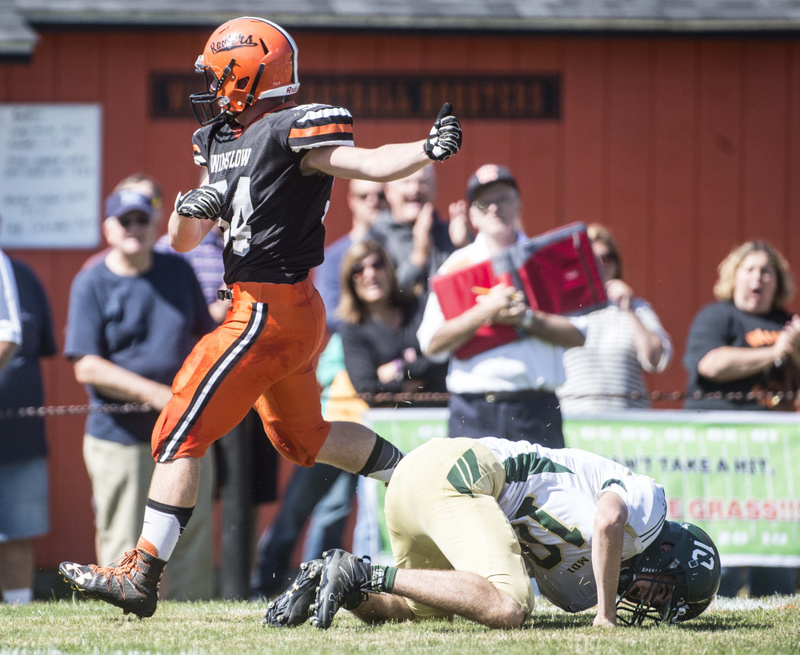 MDI marched to the Winslow 33, but on second down and 10, quarterback Andrew Phelps fell for a four-yard loss. 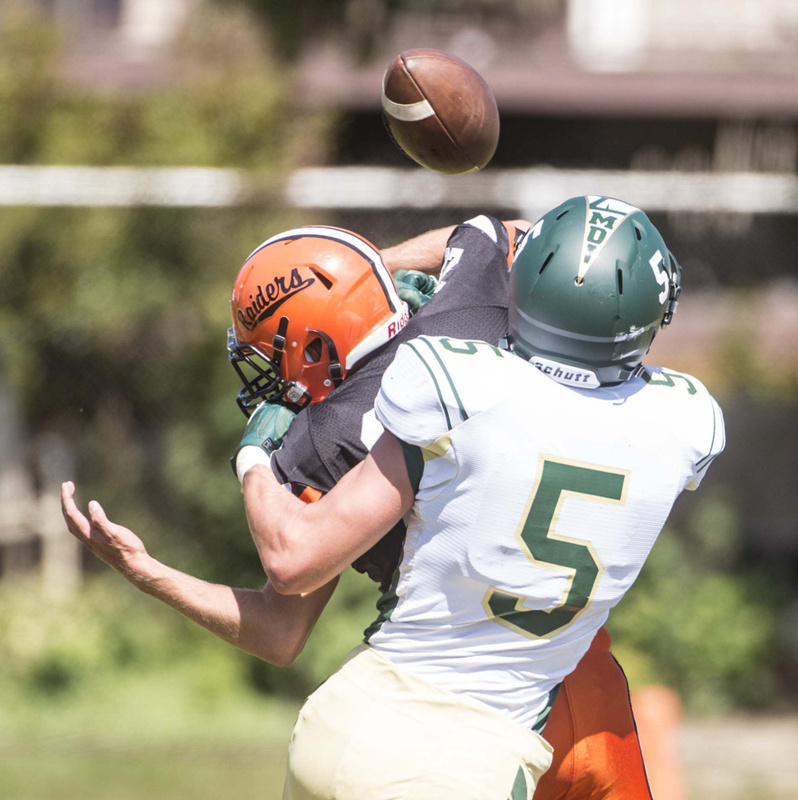 An offsides penalty set MDI in third down and 19, and a pair of incomplete passes ended the threat. Winslow took a knee twice to preserve the win. 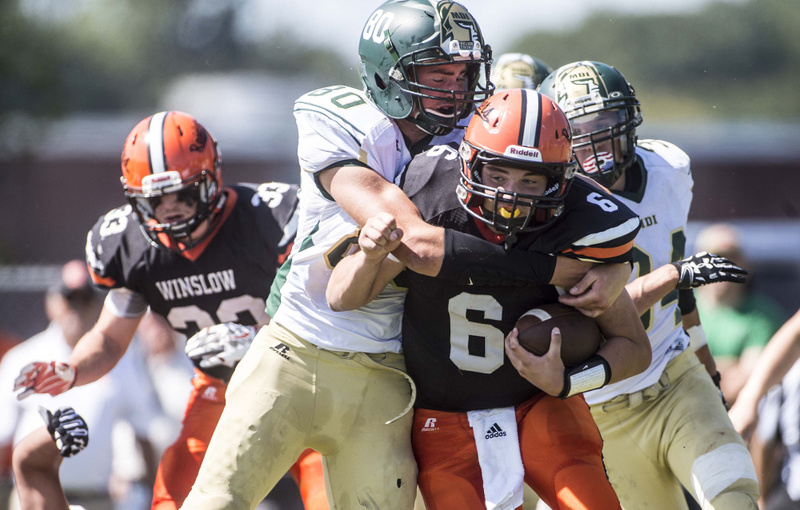 A pair of second half fumbles, one in Winslow territory, were costly for the Trojans. With 5:32 left in the game, the Trojans lost a fumble on the Winslow 32. The Trojans did put together one of their famous grind-it-out drives, opening the second half by going 60 yards in 16 plays and taking close to eight minutes off the clock. The drive featured three fourth down conversions, including a fake punt pass from Phelps to Abrahm Malloy for 12 yards. Shields said Phelps called the fake punt on the field when he saw Winslow’s formation. Phelps capped the long drive with a four-yard scoring run, giving the Trojans a 20-14 lead. 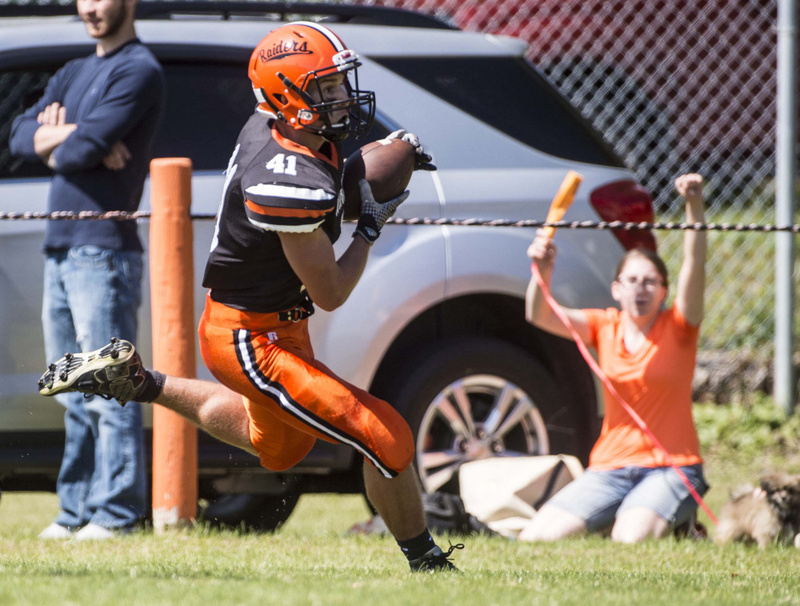 The Black Raiders answered with 16.2 seconds left in the third quarter, when Alex Demers capped a seven-play, 55-yard drive with a four-yard touchdown run. Ryan Gagnon’s extra point gave Winslow the 21-20 lead. Siviski credited the line play on both sides of the ball as the key to the win. “The line play was something else. We told the kids all week, ‘Hey, you’ve got to win it up front.’ They’re huge. They’ve got everybody back,” Siviski said. 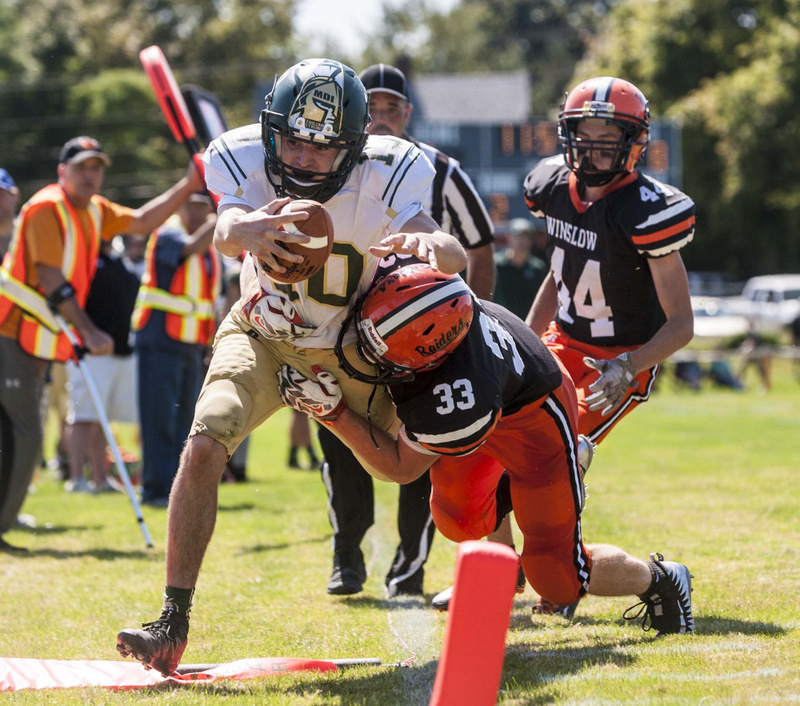 Knowing MDI can play keep-away with its run-heavy T offense, the Black Raiders often lined up in the double wing, in an attempt to run the ball and use up the clock themselves. 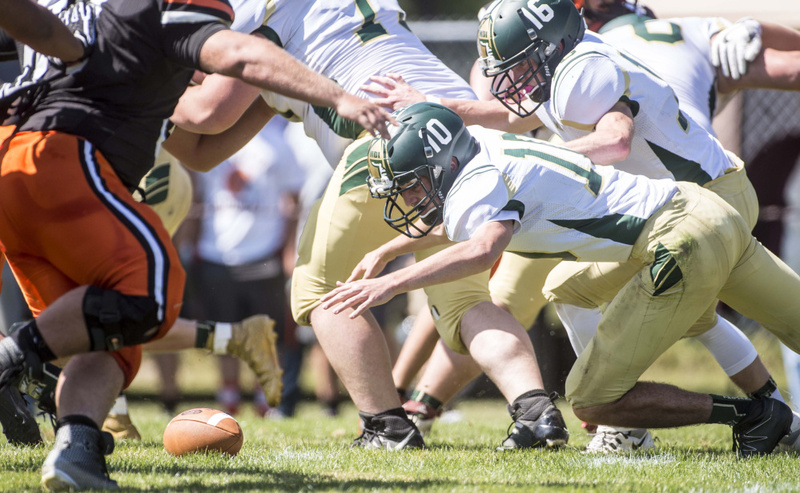 After Ben Dorval opened the game with a 30-yard kick return, Winslow went 55 yards in five plays, taking a 7-0 lead when Dorval broke off a 22-yard touchdown run. 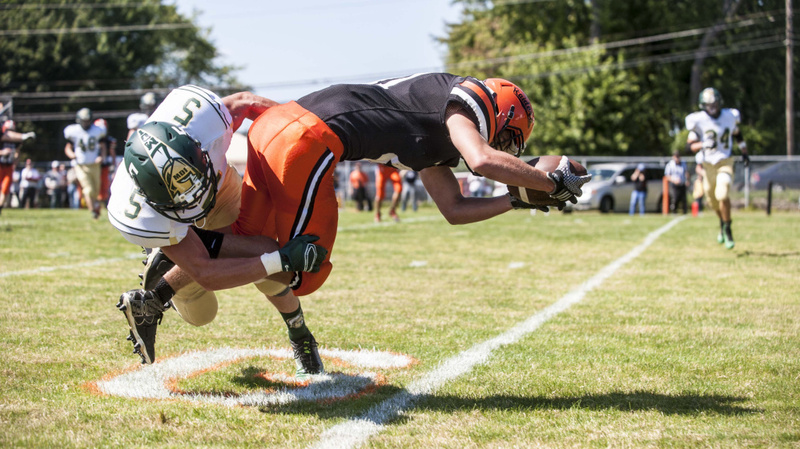 MDI responded with a 91-yard kick return for a touchdown by Billy Kerley, and when Colby Lee ran in the 2-point conversion, the Trojans had an 8-7 lead two and a half minutes into the game. Winslow regained the lead late in the first. After getting the ball on the MDI 13 after a turnover, Dorval caught a 12-yard pass in the flats from Gagnon for a 14-8 lead. The Trojans tied the game on the second play of the second quarter, a four-yard Alden Fournier touchdown run. 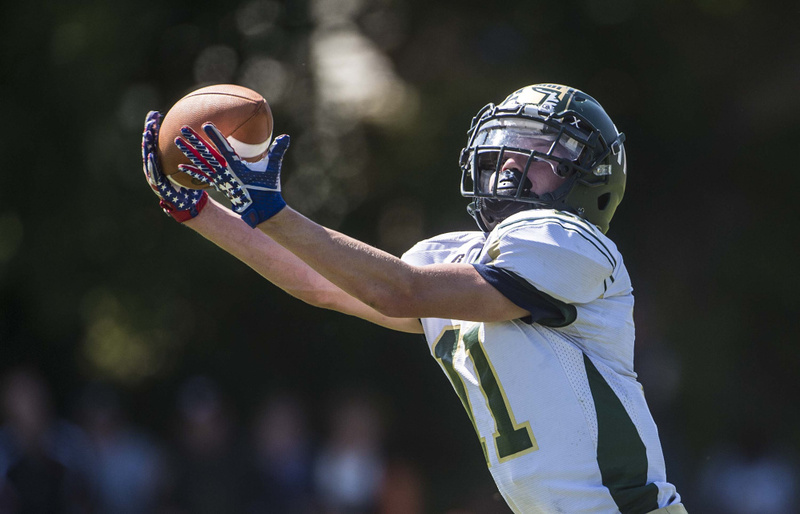 The touchdown was set up by a 45-yard Phelps to Malloy pass out of a shotgun spread formation, a wrinkle MDI coaches added to the offense this season. 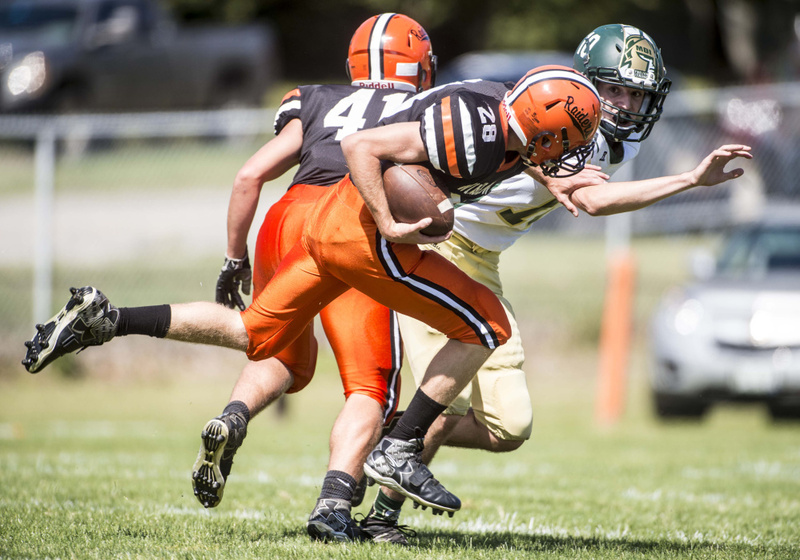 Lee gained 130 yards on 17 carries to lead MDI’s offense. Dorval had 101 yards on 17 carries for the Black Raiders. Isaiah Goldsmith gained 72 yards on 10 carries for Winslow.